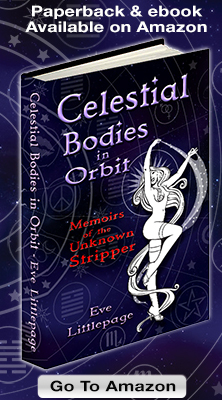 Arturo, my husband of nearly twenty years, has also been my partner in creating CELESTIAL BODIES IN ORBIT: Memoirs of The Unknown Stripper. From hearing me read drafts for the past six years (that alone should earn him sainthood! ), to helping with all of my computer tech, website and blog set-up, Kickstarter video and photos, formatting the books to get them on Kindle and in paperback, I can’t even count the ways. I only know that I couldn’t have done it without him. I was in the thick of getting books and ‘Rewards’ out to my Kickstarter Backers, when Arturo and I hit one of those little bumps in the road of life. The good news is it was a bump, and not the fall-off-the-cliff it could have been! On Tuesday night January 15th I called 911, as my dear Arturo was having some extreme symptoms. It turns out they were caused by a large kidney stone. Nasty, and uncomfortable, but not life-threatening. However, they discovered he had an Abdominal Aortic Aneurysm. It could have burst anytime, and if it had, it would have ended his life in minutes. Fortunately, it was discovered and he had surgery on the 18th to repair it. He is healing very well, and we are both coming around after being quite ragged-out by the whole shock of the experience. The worst of it is behind us. We are looking toward the future with optimism, and with renewed appreciation for the beauty and fragility of life. Now I find myself sitting here, scratching my head a bit, thinking, Where was I? What should I be doing next? I know I need to get back to promoting this book, which we have both worked so hard to publish. But I’ll admit I’m struggling a bit. It feels like I’ve been tossed off the Merry-Go-Round and into some kind of time warp. Life is still spinning around, too fast for me to comprehend, but I’ve got to pick up some speed and try to hop back on. 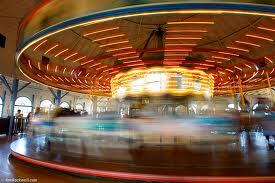 That is what life demands of us–get back on the Merry-Go-Round. But don’t forget to inhale deeply and breathe in the sweetness of each precious day. « Kickstarter Rewards On The Way!